Read this article online in the Learning Solutions Magazine or below in our blog. Tablets are in many ways the ideal mLearning device. They are the right size, have great sound, screens and graphics, are reliable and with 3G are online all of the time. The iPad, which will have a stranglehold on the market for the foreseeable future, has one big issue… it does not support Flash or Java. Impatica for PowerPoint Version 5, which will be introduced at DevLearn 2011, converts fully narrated, animated and interactive PowerPoint files into a format compatible with Impatica’s new HTML5 player. Content now can be built once and delivered everywhere, even on iPads and iPhones. In the 90’s Microsoft PowerPoint became the standard way that content was presented in the classroom. Ten years or so ago when folks started to make classroom and other courses available online they went searching for tools that would turn their existing presentation content into compelling eLearning objects. They found a number of packages that converted PowerPoint to Flash and our Impatica for PowerPoint, which converts PowerPoint into a highly compressed file that uses our proprietary Java player. Shortly after the launch of the iPad in April 2010, Steve Jobs published an open letter on Flash. The world changed. HTML5 now had the backing of the biggest innovator of our lifetime. It was now a legitimate and viable technology to replace Flash. It offered a single, standard, firewall-friendly and plug-in free way to deliver sophisticated content to both computers and mobile devices. Corporations, universities, colleges and other organizations have been flooded with iPads. The way we work and consume content has been changed forever. Except for the fact that there is no Flash or Java, tablets seem ideal for mLearming. Given that existing conversion software does not do the job, eLearning professionals are faced with a decision to purchase tools that allow them to create their content directly in HTML5 format. That would mean drastic changes to workflow, a major undertaking to re-create existing content and a commitment to make two versions of content in order to support both HTML5 and legacy platforms. The player in Impatica for PowerPoint Version 5, which will be demonstrated at DevLearn (booth 308), uses HTML5 when it is available and Java when it is not. A simple drag and drop is all that is required to convert PowerPoint content into high-quality online presentations that will play everywhere: on computers, iPhones, iPads and other devices. That means users can continue creating great content using the tools they know without having to worry about where and how it will be viewed. 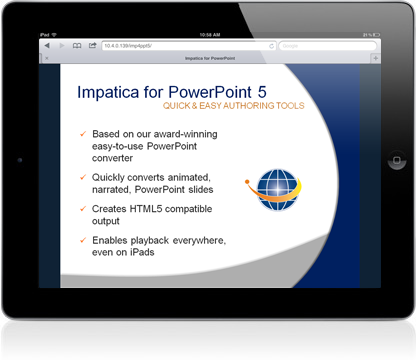 Most customers use Impatica for PowerPoint at their desktop. They create their presentation in PowerPoint including narrations, animations and transitions. They convert or impaticize the presentation and upload it to an LMS or web server. It is really very simple! OnPoint Digital of Savannah Georgia has been an Impatica partner and customer for almost nine years. Three and a half years ago, OnPoint licensed Impatica for PowerPoint and integrated it into their award-winning CellCast Solution. Their customers simply upload their PowerPoint content. CellCast converts and stores the impaticized version. Users install an app on their mobile device to display and interact with the content. Making the transition from legacy technologies to HTML5 can be simple. With Impatica for PowerPoint version 5, organizations can build once and deliver everywhere using the skills and content they already have. That’s great news. I just viewed the demo link Michael sent me on my iPhone and it was perfectly rendered (animations, audio, and all). I heard the release of the next version is delayed for a little while longer while the company completes the transition from Java to Flash for PC viewing. I think that is a good call. While my main concern right now is mobile compatibility, I think Flash is still the best choice for PCs. It is great the way you guys are moving forward with HTML5. Everyone else is really lagging.